Happy Friday! I haven't done a Friday Favorites post in a while so I thought I'd bring one back with some things I have been loving lately! Here we go! How cute are these cases? I love switching up my phone case from time to time and love all the options The Casery has to offer. They have cases for both iPhone and Samsung and a ton of options to choose from. Direct links for my cases below. I LOVE trying new makeup products. I might not always know what I'm doing, but I am definitely a makeup junkie. I was excited to try this primer from Glo Minerals because I've loved so many of their products already (I actually use this foundation everyday). This product is super light-weight and evens out your skin tone so your makeup has an even and flawless look. I've also worn alone for days where a full face of makeup isn't necessary, but I still want a little bit of coverage. BONUS! It has SPF30 which is amazing. Sun protection is key, especially for your face. Not only does it help prevent skin cancer (hello, speaking from experience here) but it also keeps your skin looking young. No one wants wrinkles at age 40, am I right? Also pictured, Glo Minerals Suede Matte Lip Crayon. Love these lip crayons - super moisturizing and the colors are amaze. Plus there is a sharpener in the cap. Jewelry is from Park Lane Jewelry which I've been wearing in a lot of my recent outfit posts. I love everything I've received from them - GREAT quality. I'm kind of picky when it comes to perfume scents, but always looking for fun new ones that might spark my interest. I tried out all of the Pinrose scents and Wild Child was hands down my favorite. It has a floral + vanilla vibe thats light and yummy and perfect for summer. I also love that they have these cute little packs (on the right side) that are perfect for travel. It's a single use little wipe that you can dab (insert dance move here) for a quick scent touch up on the go. The packaging is also super cute, I love the little magnetic box the perfume comes in. And it comes with a witty little fortune! Not pictured, but my fortune said, "Knowledge is knowing a tomato is a fruit, wisdom is not putting it in a fruit salad." I love cute and fun little things like that, I think they make products all the more special. That's it for this week! I have some other beauty stuff I've been loving lately and will be sure to share soon for another Friday Favorites. If you have anything you'd like me to try and review, let me know! Have an awesome weekend and thanks for stopping by! Some of the products were gifted, however all opinions are my own. We made it to Friday! Today on Friday Favorites, I'm sharing a new nail salon in Denver that I recently visited and fell in love with! I bring you, Haven Nail Salon. You may have seen my snaps (username: mallorysauer) when my blogger friends and I visited the salon for manicures. Let me tell you, the space is darling. 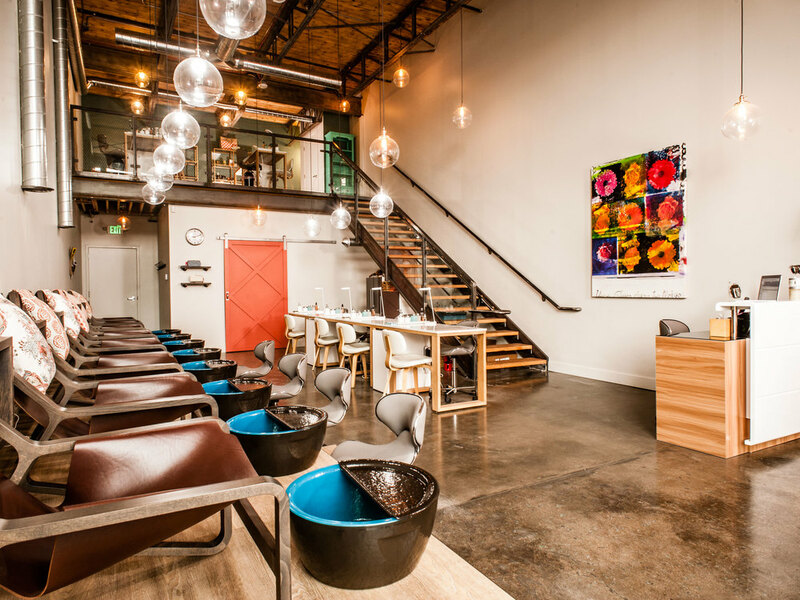 They're located in RiNo, you can book appointments online, and their main focus is cleanliness (can I get a "YAS!"). They offer a variety of services and are super talented when it comes to nail art (look at the conversation hearts they did on Natasha). It's been almost two weeks since I had my nails done, and I still don't have any chips! In addition to their nail services, they have cute accessories for purchase (I had to have the fringe clutch shown above, oops). Overall I give this place a 10 - definitely a place to check out if you're in the Denver area! Happy Friday everyone! Hope you've had a wonderful week so far! Today I'm bringing back Friday Favorites and sharing a new body scrub I recently tried.